Why not bake some homemade dog cookies? Fido gets a treat, and you have the comfort of knowing their exact ingredients, Here's another tasty and easy recipe from pet lifestyle advisor Wendy Nan Rees. I often find myself in a last-minute pinch to make for treats for my dogs, or to give as a gift for a friend's dog. I was invited last weekend to my sister's dog's first birthday party and had only twenty-four hours to think of a gift. Yes, I could go buy a gift, but being a pet lifestyle advisor, how would that look when I showed up to the party with a store-bought gift? I went to my pantry to check what I had on hand. To my happy surprise, I had enough supplies to make my "Peanut Butter Slice and Bake Biscuits". So, I thought I would share this recipe with you this week. This is a nice, easy treat that is fun to make, and you can even get the family involved if you want to. It is a great project for a rainy weekend when the kids are stuck inside and complaining because there is nothing on television. In a pot on top of the stove, place your peanut butter, molasses, water, wheat germ and salt. Warm at medium heat. Melt the ingredients together, whisking quickly. Once melted and smooth, take the peanut butter mixture, which should now be nearly liquid, and put in a small bowl. Measure your flour into a large mixing bowl and fold in your liquid mixture slowly until your dough is soft. Be sure to have a well-floured board ready to go! Once you have your dough mixed to the consistency you desire, turn it onto your floured board, roll it into a log shape. Place it in the refrigerator for two hours until your dough is hard enough to slice into ¼-inch sections. If you are in a real rush, you can place it in the freezer for ½ hour until firm. Have a cookie sheet ready to go and spray it lightly with a non-stick spray. Place your slice and bake cookies on the cookie sheet. Put the dried beef in a blender or food processor to chop it. Sprinkle the top of each cookie with your shredded, dried beef. Bake for 25 minutes. Turn off the oven and let your cookies dry out as the oven cools down. This will make them hard and help keep them fresh. It will also bring out the flavor and make it more intense. 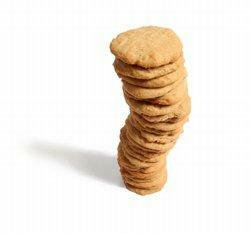 Once your cookies have completely cooled, it is time to place them in an air-tight container. You can either gift wrap them if you are giving them as a gift, or store them in your freezer up to three months until you are ready to serve them. You can also store them in the refrigerator for up to two weeks. To save time in a pinch, you can also make the dough and freeze it for up to three months until you are ready to use it. I love these slice and bake treats because they are fun, fast and, most of all, easy!